Florent Chauvancy, Safran v-p for heavy helicopter programs, said the Aneto line will have several models. Safran Helicopter Engines, based at Bordes near Pau, France, launched its new “Aneto” family of powerplants at the Helitech Conference & Exhibition in London on October 3. It also revealed that the first model in the family, the Aneto-1K, had already been selected by Leonardo as a new engine option for the AW189, with first flight having taken place in March this year. The new variant of the helicopter will be designated AW189K, with entry-into-service slated for the fourth quarter 2018. The Aneto-1K is rated at 2,544 shp with emergency (one engine inoperative) power for twin-engine helicopters of 2,977 shp. Its internal configuration is 3AX + 1CC+ 2HP + 2PT (three-stage axial compressor, combustor stage, two-stage high-pressure turbine and two-stage power turbine). 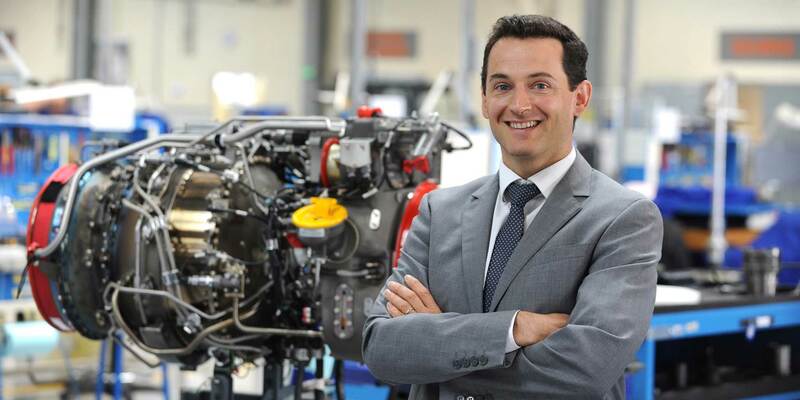 Florent Chauvancy, Safran v-p for heavy helicopter programs, said this will “bring to the market 25 percent-higher power-to-weight ratio” or help with performance in hot and high conditions—along with “15 percent-lower operating costs through better fuel consumption and other capabilities.” The Aneto engine will also require “very much less scheduled maintenance than any other engine on the market” through the use of advanced health monitoring. Chauvancy said, "It’s a complete family; not [just] one engine…The name goes back to the roots of Turbomeca–[Aneto] is the highest mountain or summit in the Pyrenees, near our headquarters.” The existing Arrius engine was named after another nearby mountain peak. “There will be several models to address the market requirements” in the eight-to-15 metric ton (medium-to-large) helicopter class. “This is something nobody else offers at the moment,” he said. A new logo has been designed, resembling a mountain but having three color tones, suggesting “potentially three models” in the family, he added..
“It’s the first time we’ve taken [the power delivered almost to] 3,000 horsepower,” he said. “We won’t reach 3,000, to be honest with you, but there are various technical innovations we’ve developed so far that would allow this. It will depend on the airframe requirements.” He noted that keeping operating costs low was a design priority. Among many new features—many of which were developed as part of the company’s Tech 3000 program—the Aneto has a four-stage compressor, new dual-channel Fadec, new materials in the high-pressure turbine, “gyratory” combustion chamber with 3D-printed injectors and a new inlet guide-vane system and diffuser vanes with 3D-printed parts.